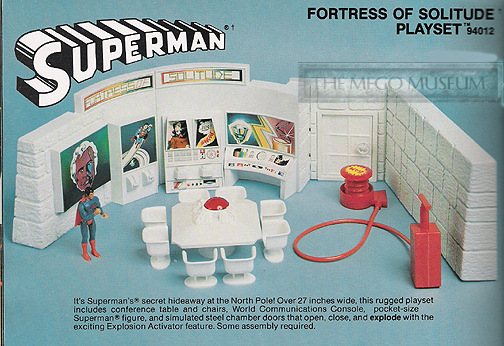 The Fortress of Solitude Playset is one of the most highly demanded pieces in the Comic Action Heroes collection. Mostly because in reality it’s a very accurate representation of the Hall of Justice from the Superfriends television series. 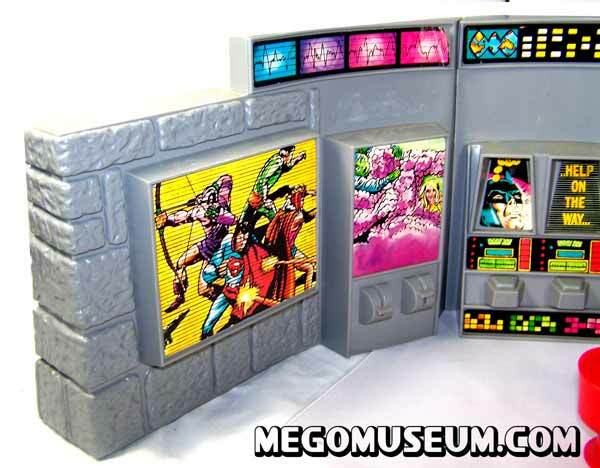 Mego was already releasing a Hall of Justice for the Worlds Greatest Superheroes, so they quickly renamed this piece to avoid confusion. 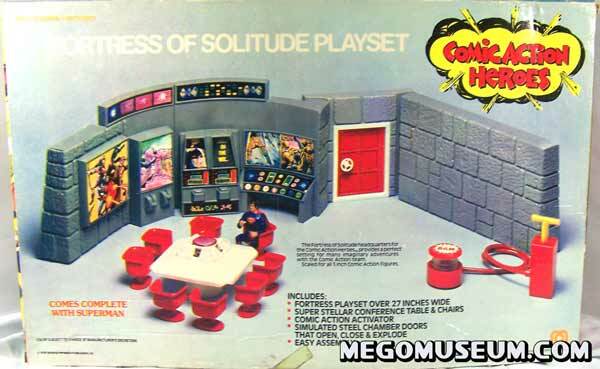 There are actually two versions of the Fortress playset, this is the earlier version (note the door is missing in these shots but should be there) The brick wall attached juts out at almost a 45 degree angle on this version. 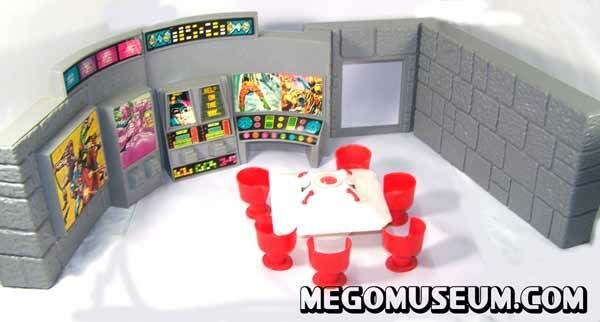 The Chairs Alternate colors from Red to White on these sets, neither is considered more rare. 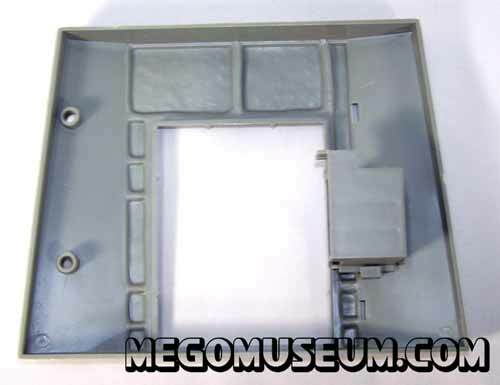 The Panel on the first version FOS features grey molded details and console walls. 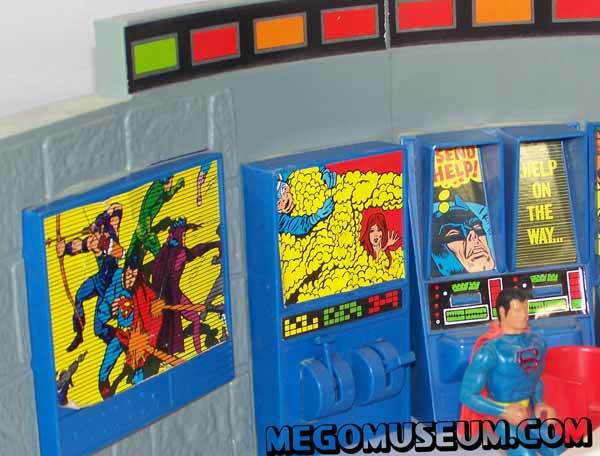 Note that Superman is fighting alongside the Avengers on the view screen. The early version relies a great deal on decals. Also Batman appears to be in a lot of trouble in two different places. The Early Fortress design uses rounded peg holes and features a separate piece that clips to the door frame. 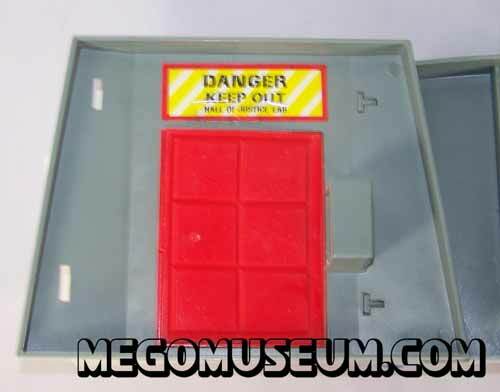 This is so the Penguin can attach the Comic Activator to the door and burst his way in. The system is now built on square pegs and the brick wall no longer comes out at an angle. 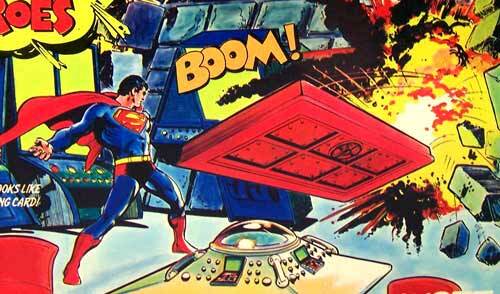 The First Issue Box is larger than later releases, note Superman is saying “That looks like Penguin’s calling card” I never knew…. 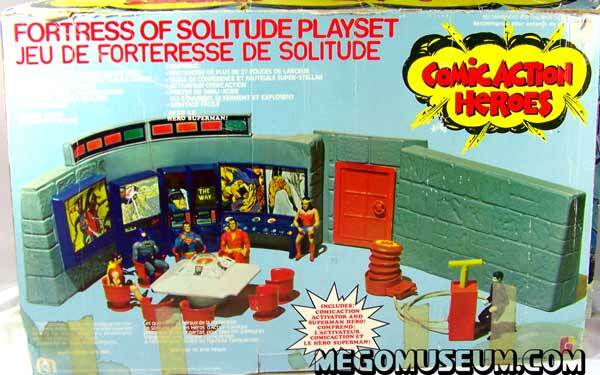 Note the white trim on the door and the hand painted Superman prototype figure. The Second version of the Fortress has been greatly redesigned and is actually more attractive. 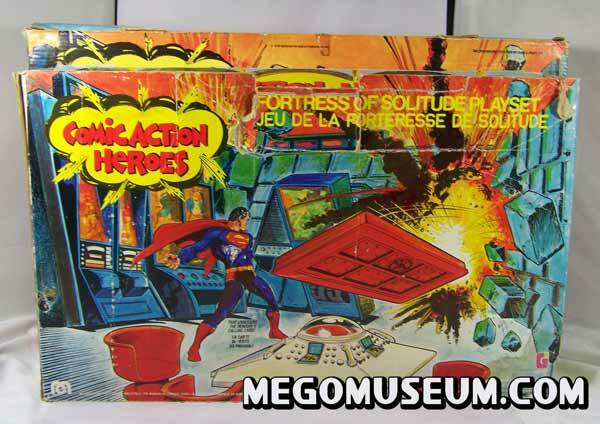 The top decal gives it more of a superfriends quality than before. The system is now built on square pegs and the brick wall no longer comes out at an angle. The grey panels have now been replaced by movable blue panels, the levers on the computer actually work. 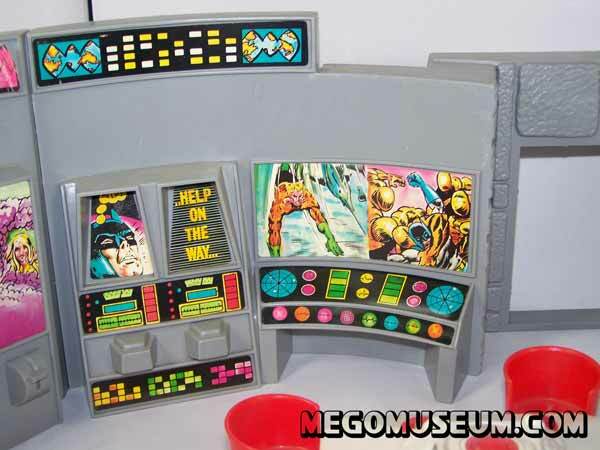 The panel on the far right now has a molded computer facade, relying less on decals. 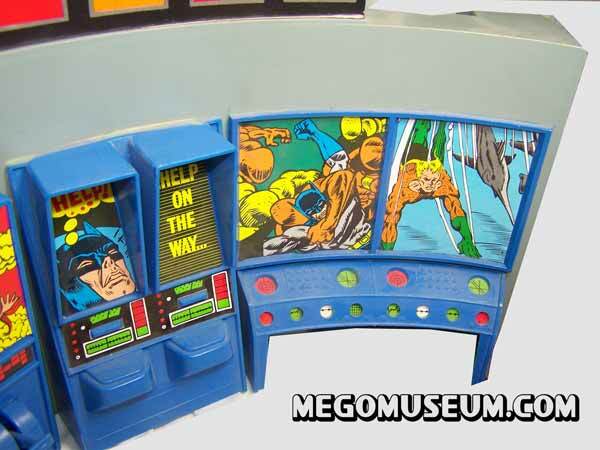 The Door frame now has the clip for the Comic Activator molded on. Whoops! 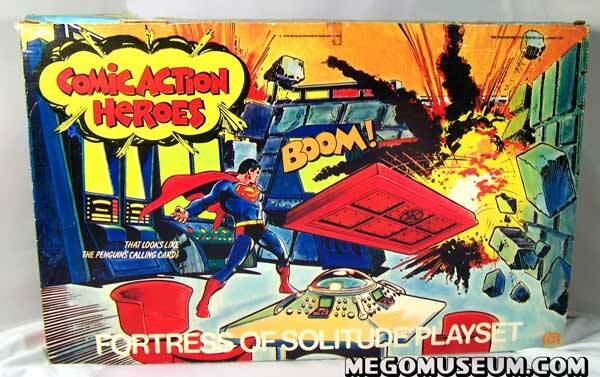 I guess we forgot that this was supposed to be the Fortress of Solitude! Placed here for size is the second issue (in this case a Canadian Grand Toys) box in front of a first release to give an idea of scale. The Joker is now featured as is most of the Justice League in this revised photo, despite the fact that Penguin is still mentioned on the front and the sides of the box. Hand Painted prototype Comic Action Heroes are featured on the back and they look smashing.